OLBC recently completed a full-house refurbishment project on Princedale Road, in Kensington, west London. Our clients wanted to achieve a modern, minimalist feel inside their Victorian family home. 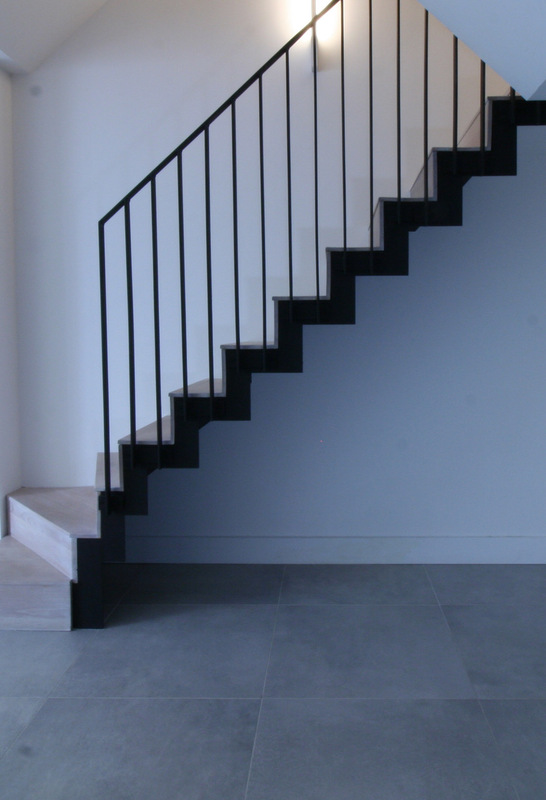 One of the challenges was to replace the traditional timber staircase with turned spindles with a sleek steel framed staircase, clad in oak and finished with a contemporary black balustrade. Staircases, although functional, can make stunning features. In this case, the clean lines create a sense of orderliness as you pass through each floor. 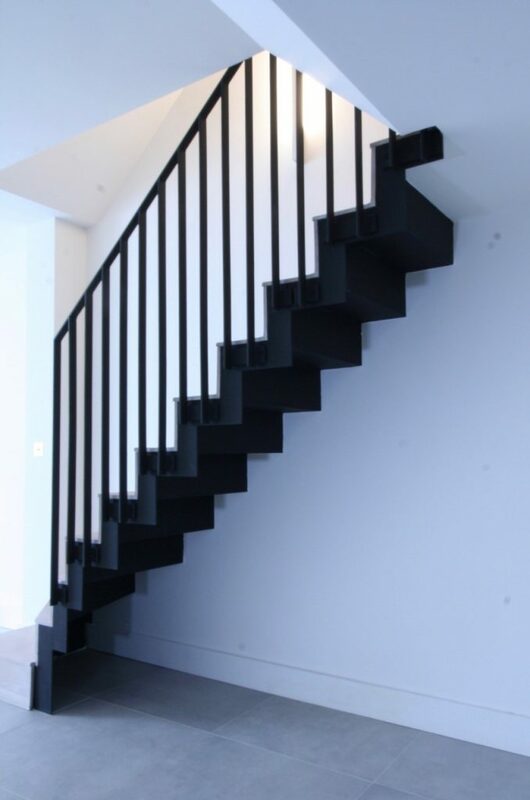 The steel staircase creates striking impact, set amongst the monochrome interior. The contrasting lines draws attention to the depth of space between the roof light two floors above. The glass balustrade creates a feeling of openness and allows the light to flood in from the roof light, exposing the span of bare walls. And at the heart of the home is a spectacular slice of architectural drama. The most distinctive element of a contemporary style interior design is line. Due to the nature of steel, there is no margin for error. The results are completely objective. Small measurements create huge impacts, which is why it is key to get the proportions right from the very beginning. Tim B, whom sourced and installed the steelwork, engineered the design with laser precision. Tim works for one of the most successful steel companies in the UK, which designs, supplies and installs steel for over forty projects daily. Tim’s scope of work is vast, ranging from structural beams through to quirkier designs, including designing the winning post for the Derby. Tim has an art degree, where he learned about three-dimensional design, which taught him to channel his creativity in a productive and functional way. I spoke with Tim about how he moved through the process of engineering the staircase. Tim engineered the staircase to enable the stringers (which support the weight of the steel) to become invisible, by recessing them into plaster. 3D mock-ups were used to ensure the product was perfect before it was put into production. There are three flights of stairs, each with a slight difference, illustrating the changes in the structural parameters. 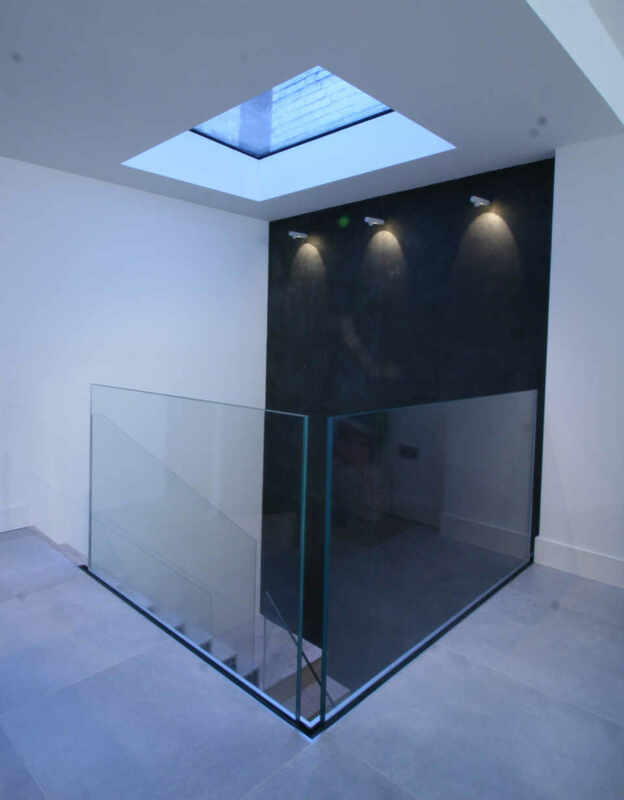 A full height glass balustrade fixed to the staircase with top line recessed to the ceiling for a sleek overall appearance. Tim’s experience, combined with the exceptional talent of our team of interior designers, architects, engineers and planning experts allows OLBC to manage your project with the highest level of care.